The first person who got it unzipped the backpack and removed a large framed picture. The lady who gifted it gasped, “Oh, that’s mine!” and raced to reclaim it, tucking it face-down under her chair. Though I was curious to know what this picture was of (large winky face) I refrained from peeking out of great willpower. You can steal something three times, and I was the 17th up. By then the picnic backpack had been stolen twice. 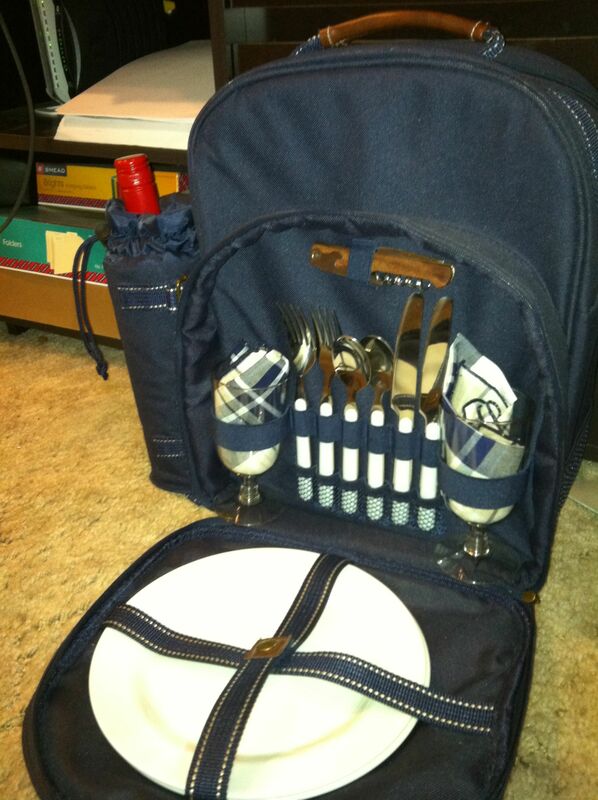 Friend Nancy came up with some Machiavellian plot she tried to get people involved with (you get me the backpack, and I’ll steal you the martini glasses) but I wanted the backpack for my own. I’d just seen one like it in a catalog. So when my number was called, I casually walked up and claimed it from the very sweet Miranda who had it (Miranda being so nice it was like kicking a kitten) and strolled back to my spot as the women cheered. You see, it’s not my style to crow and carry on; do not my actions speak loud enough? Shall I have to raise my voice above the din to make it heard? Can I think of any other hyperbole? (This last is for Nancy, who, the next day, complained that I was way too quiet about it or something).